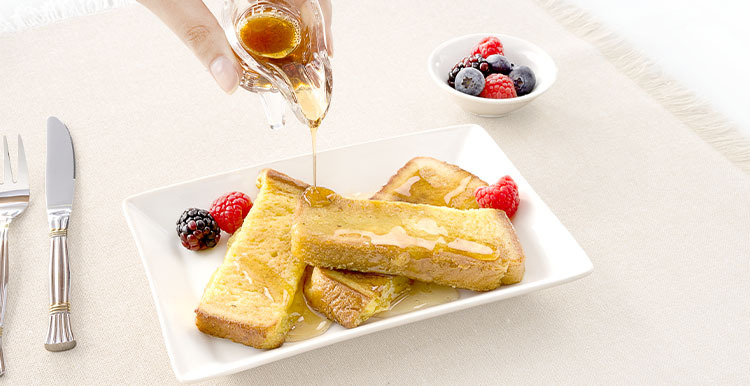 Indulge in these delicate cuts of golden French toast with delicious notes of sweet maples and buttery flavor, and a hint of vanilla. Ingredients: EGG MIX (EGGS, WHEY [FROM MILK], SUGAR, 2% OR LESS OF SALT, NATURAL FLAVOR, XANTHAN GUM, CITRIC ACID), BREAD (WHOLE WHEAT FLOUR, WATER, ENRICHED WHEAT FLOUR [FLOUR, MALTED BARLEY FLOUR, NIACIN, REDUCED IRON, THIAMIN MONONITRATE, RIBOFLAVIN, FOLIC ACID], WHEAT GLUTEN, SUGAR, YEAST, SOYBEAN OIL, SALT, MONO AND DIGLYCERIDES, CALCIUM PROPIONATE [TO PRESERVE FRESHNESS], CALCIUM SULFATE, MONOCALCIUM PHOSPHATE, SOY LECITHIN, POTASSIUM IODATE), GLAZE (SOYBEAN OIL, SUGAR, MONO AND DIGLYCERIDES, NATUAL FLAVORS, SALT). Nutrients: EGG MIX (EGGS, WHEY [FROM MILK], SUGAR, 2% OR LESS OF SALT, NATURAL FLAVOR, XANTHAN GUM, CITRIC ACID), BREAD (WHOLE WHEAT FLOUR, WATER, ENRICHED WHEAT FLOUR [FLOUR, MALTED BARLEY FLOUR, NIACIN, REDUCED IRON, THIAMIN MONONITRATE, RIBOFLAVIN, FOLIC ACID], WHEAT GLUTEN, SUGAR, YEAST, SOYBEAN OIL, SALT, MONO AND DIGLYCERIDES, CALCIUM PROPIONATE [TO PRESERVE FRESHNESS], CALCIUM SULFATE, MONOCALCIUM PHOSPHATE, SOY LECITHIN, POTASSIUM IODATE), GLAZE (SOYBEAN OIL, SUGAR, MONO AND DIGLYCERIDES, NATUAL FLAVORS, SALT).